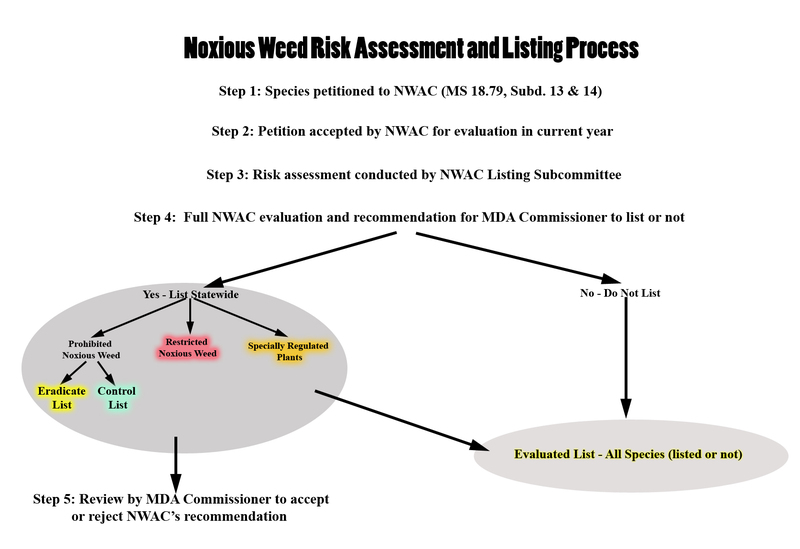 This diagram shows the Minnesota Noxious Weed Advisory Committee risk assessment and listing process. In 2013, non-native Pragmites became regulated as a Restricted Noxious Weed in Minnesota. This means that the importation, propagation, sale, and transportation (in violation of Minnesota Statute 18.82) of non-native Phragmites propagating parts is not allowed in the state. Landowners who have Phragmites on their land are not required by law to control it. Minnesota reached this classification through a risk assessment of non-native Phragmites conducted by the Minnesota Noxious Weed Advisory Committee (NWAC). NWAC is a multi-organization committee that advises the Minnesota Department of Agriculture as to which species should be regulated as noxious weeds. NWAC uses a formal risk assessment to make recommendations. Click this image to go to the download page for the MN Risk Assessment Worksheet for phragmites. No surveys exist to document the range of non-native Phragmites in Minnesota; therefore, this species is not documented to be widely distributed in MN. However, there are enough known stands to determine that eradication is not feasible in Minnesota. There are also examples where it was purposefully planted in biosolid treatment sites. By adding non-native Phragmites to the Restricted Noxious Weed list we hope to reduce human-caused introduction of non-native Phragmites. Other work will need to focus on addressing the infestations we already have. There were several concerns that prevented non-native Phragmites from being added to the Prohibited Noxious Weed List which would mandate that landowners control the plant. One issue was the difficulty for the average landowner in identifying Phragmites and determining if they had the native or non-native Phragmites. A second concern was the potential for negative environmental impacts of control in wetlands by homeowners. A third concern was the high cost burden that mandatory control could put on landowners. Having non-native Phragmites on the Restricted Noxious Weed List makes it illegal to sell and plant it. It will also provide additional opportunities for outreach on the prevention and management of non-native Phragmites.